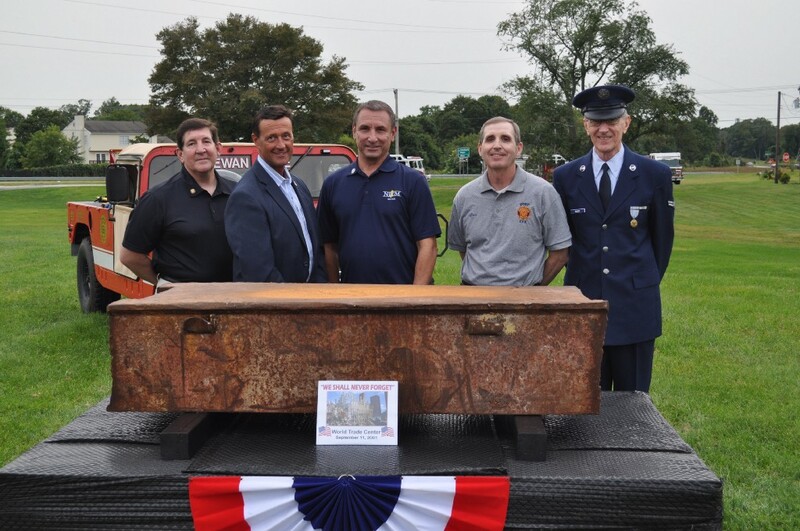 Clockwise from top left: Councilman Jeffrey Jacques, Councilman Don Heim, Mayor Louis Manzo, Richwood United Methodist Church Pastor Steven Herman and Mullica Hill Baptist Church Pastor Alfred McLeod are pictured with a piece of steel, originating from one of the World Trade Center towers. 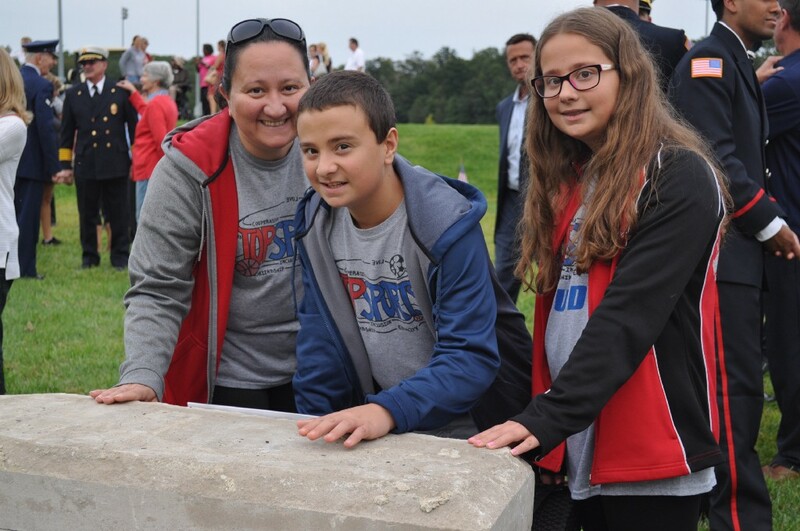 Maria, Justin, 13, and Jessica Blnada, 11, place their hands on a piece of granite from the attack on the Pentagon building in Washington, D.C., on Sept. 11, 2001. 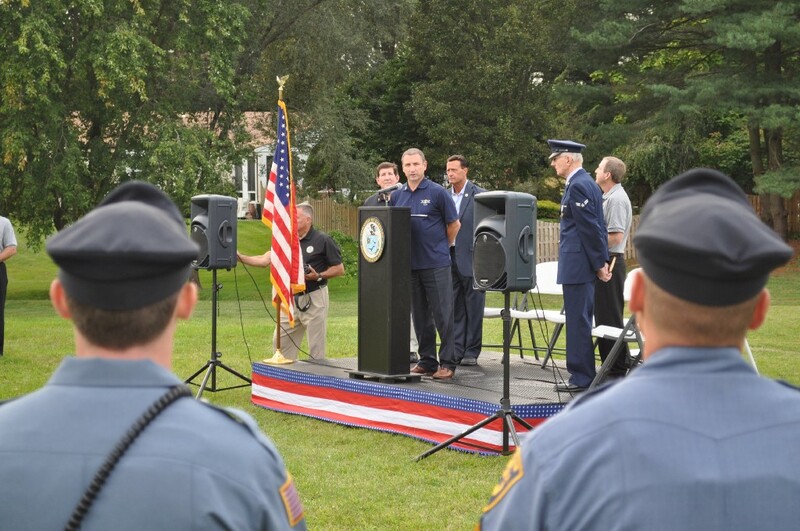 Harrison Township first responders bowed their heads in prayer, remembering those who gave their lives, and their families, on the 16th anniversary of the Sept. 11 terrorist attacks in New York City. 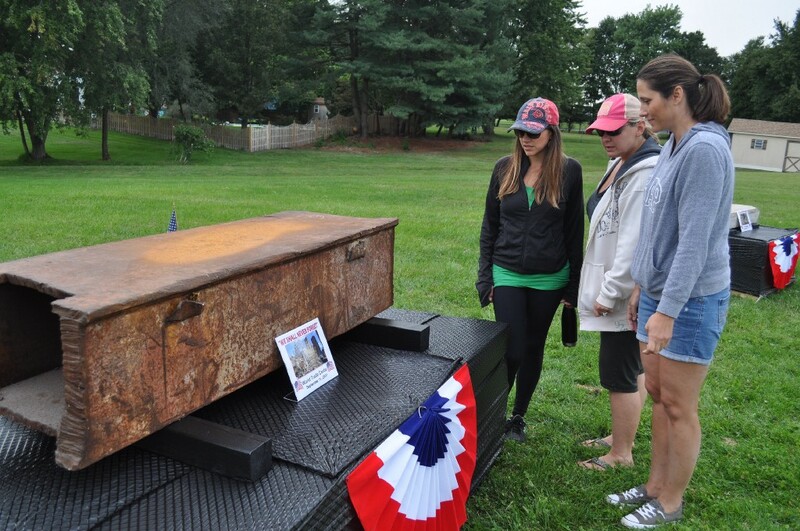 Mullica Hill residents, from left, Erin Moore, Janette Coslop and Risti Labella take a closer look at a piece of steel, salvaged from the terrorist attacks on the World Trade Center towers in New York City on Sept. 11, 2001. Harrison Township first responders, administrators and the community gathered at the William Wilt Soccer Complex on Monday, Sept. 11, to remember the day the world changed 16 years ago, when almost 3,000 Americans lost their lives to terrorist attacks in New York City, Washington, D.C., and the Flight 93 crash in Shanksville, Pa. Opening the ceremony with American melodies on bagpipe, and a trumpet “Taps” performance to close, the event honored those who ignited American resilience and patriotism for years to come. Mayor Louis Manzo addresses the public and Harrison Township first responders at the annual Sept. 11 memorial ceremony. Mullica Hill resident Mary Barbye said she remembers the day clearly. She had just moved to the area and happened to work in the law enforcement community when she received a call from a colleague on what had happened. Her mother, Mary Teti, said she was at the bowling alley with the bowling league she belonged to when she saw the planes crash into the World Trade Center towers on television. Manzo said of the Americans lost on Sept. 11, 2001, 115 were first responders who ran into the buildings to save the innocent. As a nation, he said, first responders are now honored more than ever. 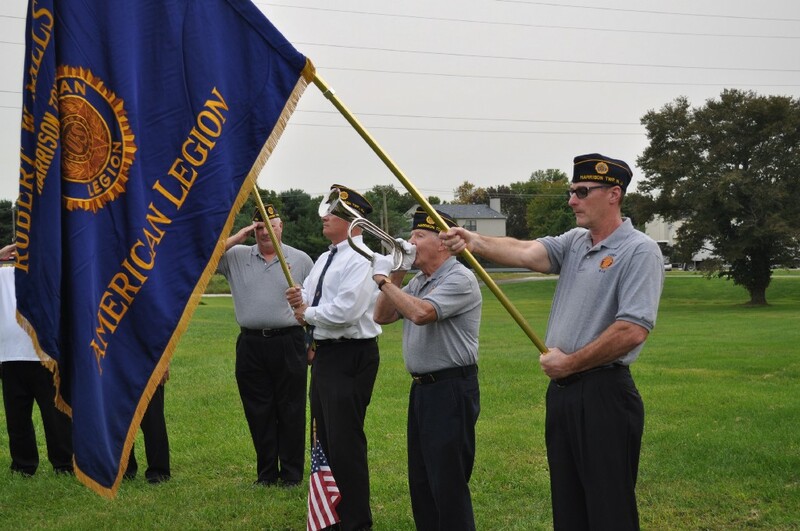 Members of the color guard presented the flags while Taps was played to close the Sept. 11 memorial ceremony. With artifacts on display from each of the day’s events, Manzo announced the completed design for a permanent space for reflection and remembrance, to be constructed in time for next year’s Sept. 11 memorial ceremony. Manzo said the location of the memorial has not been finalized, however the soccer complex is a top candidate as it offers a view of the space from those passing by on the nearby bypass. 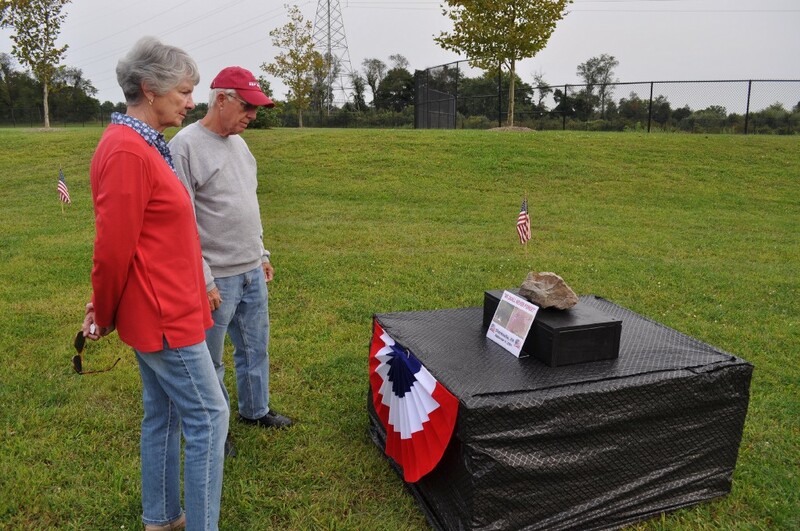 Barbara (left) and Richard Ridgway take a look at the stone acquired from the Shanksville, Penn. plane crash on Sept, 11, 2001. 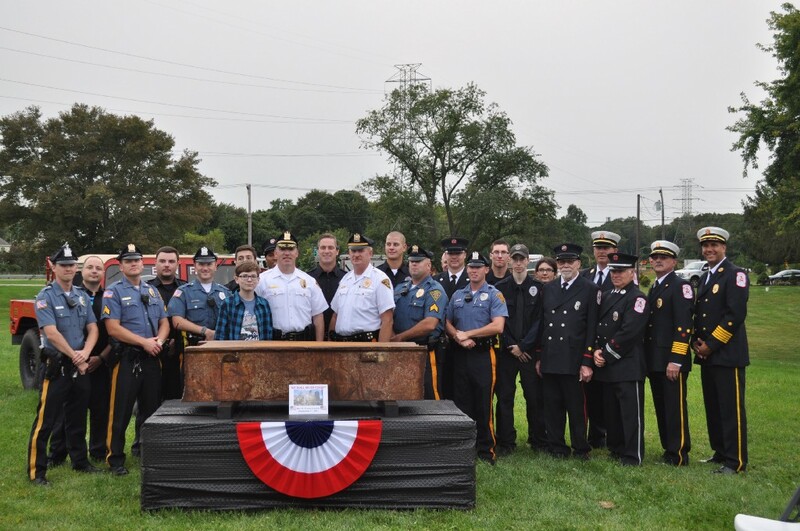 In his presentation, Manzo said more than 2,700 artifacts from that day are scattered throughout the world, and with the determination and efforts of Deputy Mayor Dennis Clowney, a U.S. Army veteran, Mullica Hill was fortunate to procure a piece of each of the day’s tragic events. According to Manzo, the memorial monument will be in the shape of a pentagon, with the various artifacts obtained by the township, such as steel from the World Trade Center towers, granite from the Pentagon building and a stone from the field where Flight 93 went down in Shanksville, Pa., surrounding the space. “We (Americans) turned those events into something now that is a day of recognition for all of the patriots and patriotic spirit that exists in the American people, and we honor the 3,000 people we lost that day,” Manzo said.